The Society of American Foresters, a national scientific and educational organization representing the forestry profession in the United States, is holding its annual meeting at the Grand Sierra Resort in Reno November 5 through 9. “Forestry in a Climate of Change” is the convention theme and it brings national, regional local leaders, scientists, students and forestry practitioners to discuss, share innovations, lessons learned and the latest technology in educational sessions and the “Forestry Expo” exhibit Hall. 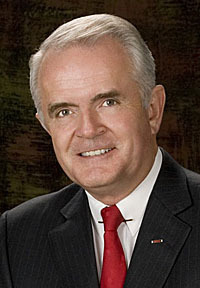 November 6 opening ceremonies will feature Nevada’s Governor Jim Gibbons, California Governor Arnold Schwarzenegger (invited) and Miss Reno 2009. Invocation will be offered by a Washoe Tribe of Nevada and California leader and the Pyramid Lake Paiute Tribe color guard will present the colors. Nearly 1,500 foresters from the United States and from around the world are expected to attend. More information can be found at www.safnet.org by clicking on the National Convention icon. CARSON CITY, Nev. — Governor Jim Gibbons today received the final report from his Nevada Climate Change Advisory Committee and received a briefing from committee members outlining key recommendations. The final report of the Governor’s Climate Change Advisory Committee is now open for a 30-day public comment period prior to the presentation of the report to the Governor. The final report is available through the Internet at http://gov.state.nv.us/ClimateSurvey.asp, where public comments can be made. Comments can also be made in writing to the Nevada Climate Change Advisory Committee at 101 N. Carson St., Carson City, NV 89701. 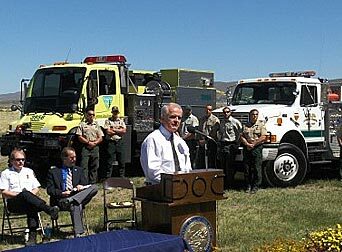 CARSON CITY, Nev.–Governor Jim Gibbons today helped kick off Nevada Wildland Fire Awareness Week with festivities at Washoe Lake State Park. Wildland Fire Awareness Week runs May 17 – May 24 and was created by proclamation of the Governor to raise awareness about individual responsibilities for preventing wildland fires and protecting life and property. The Governor encourages citizens to take part in the various events occurring all week to raise awareness of wildland fires. For more information, please visit www.livingwithfire.info.